Bison do not live in Asia (unless you count water buffalo). But, if they did I am sure they would be used in their cuisine. Since I live in Montana, I like to use them in mine. Bison is low in fat and cholesterol. These animals are raised grass-fed, and not in a feed lot. Therefore, you can feel good about eating them! Here is a breakdown comparison to other meat choices (per 3 oz serving, keep in mind method of preparation will affect nutrition content). 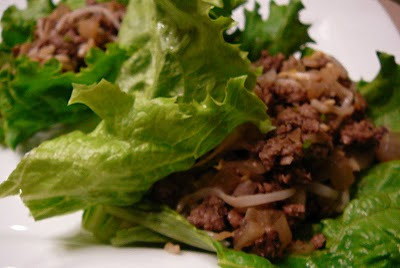 These lettuce wraps are delicious with a side of brown rice. You can also include dipping sauces such as sweet & sour or peanut sauce! Rinse lettuce leaves and pat dry. Set aside. In a medium skillet over medium heat, brown bison. Drain, if necessary, and set aside to cool. Cook onion in skillet, stirring frequently. Add garlic, soy sauce, hoisin sauce, vinegar, mushrooms, and chile pepper sauce (if desired). Stir in bean sprouts, green onions, and sesame oil. Continue cooking, about 2 minutes. Place lettuce leaves on a platter, and bison mixture into a large bowl. Allow each person to portion mixture into lettuce leaves, adding dipping sauce if desired. Wrap lettuce around meat mixture and enjoy! Nutrition Info per 3 oz serving (~2 lettuce leaves): 328 calories, 16 g fat, 6 g saturated fat, 29 g protein, 9 g carbohydrates, 2 g fiber.